The Lady (Bianca Miller) Repeller: The Holy Mandal Trinity | That's what B said. As September passes us by, the natives of this wonderful little city of ours can often be found wistfully gazing into the rising dust left in the wake of summer’s rapid departure. No more sunny afternoons in the park. No more long weekends at the shore. 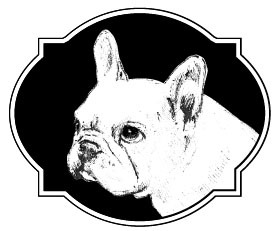 No more salty caramel bacon rosemary encrusted lamb kabob ice cream sourced from a local, organic, artisanal stationary bicycle-powered creamery/goat farm located on the roof of a Crown Heights brownstone. But it’s not all tears for Lady Bianca Miller. Heavens no! Once the scathing traumas, laid to rest with the fading sunsets of summer, are pieced apart — one can attempt (feebly attempt!) to make sense of the violent, horrid and dreadful global devastation caused by what we now know of as: The Holy Mandal Trinity. It is now, and only now, that we may join the fine people of this city and begin to take comfort in the return of the cold weather. To give my dear readers a brief historical background, The Holy Mandal Trinity dates back to ancient times — the Greco-Persian Wars — when people fought racist battles, believed in religious fairy-tales and #&$@%$#ed their siblings. Kind of like our modern-day Teapartiers! 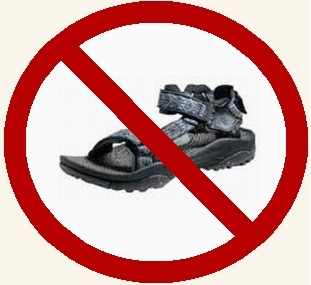 The flip-flop, the Jesus Mandal and the Teva are the three major strains that make up The Holy Mandal Trinity – a trifecta that terrorizes billions upon billions of human beings each summer, all over the globe. Though not the most primitive form of the Mandal, the flip-flop is definitely the most prolific and permeating member of The Holy Mandal Trinity to this day. Although the original intended use of the flip-flop, even in ancient times, was casual — modern-day miscreants have extended the use to prevail outside of beaches, communal showers and nail salons. The rise of the flip-flop, outside of purely casual function, has a direct correlation with the rise of certain foot auto-immunodeficiency diseases, rapid gag-reflex statistical increases, and a general rise in the dissolution of humanity and culture. 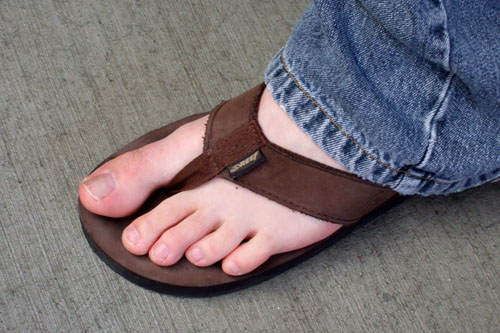 Several flip-flop strain mutations have brought about a sudden rise in the potency and immorality of the practice itself of wearing flip-flops — in no particular order: flip-flops on men, flip-flops with pants, flip-flops on men with pants, flip-flops with socks, and finally, the abominable platform flip-flop. Man with pant and flip-flop. 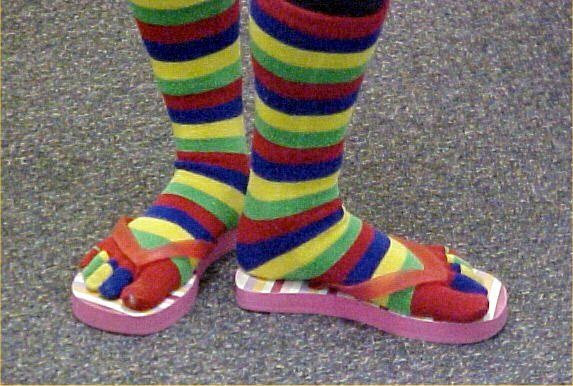 Flip-flop with particularly horrific toe-sock combination. Probable Russian prostitute modeling heinous platform flip-flop. The classic Jesus Mandal with toe over bite. The platform Doc Marten Jesus Mandal: often observed in its native habitat, the Celtic wares and crushed velvet corset stand at Renaissance Fayres across the globe. The sock with Mandal double team. And finally, the aggrandizement of the Teva economy has had a particularly disfiguring effect on the face of humankind. 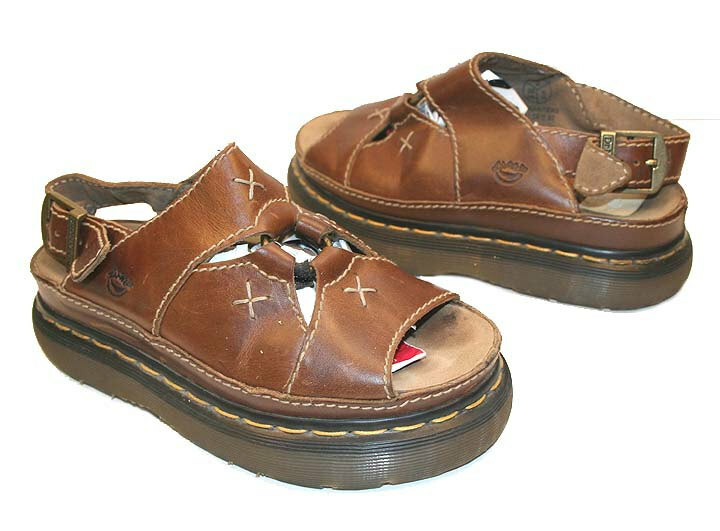 In the early 1990s, the industrialization of the hiking Mandal industry lead to a rise in the technological techniques developed to cradle and pamper mans foot, while causing vast numbers of innocent bystanders to plunge directly into the abyss of complete toxic shock. By the mid-nineties, notwithstanding the massive number of calls to consumer affairs, a one million person strong class-action suit in federal court and a recall of certain lethally defective Mandals, stores like EMS and REI would still not cease from stocking multiple Mandal strains which they both legally and illegitimately supplied to freelance journalists, lesbians, bird-watchers and Everymen around the globe. The highly evolved and dangerous Teva. So I leave you, dear readers with one question, a question that plagues me like a Herodotean tale as old as time: if we are going to live this ghastly existence we have come to call life, why not make it beautiful? Why tarnish the face of the globe and of humanity by propagating the rise of The Holy Mandal Trinity? But then again, to further ponder and counter the point: if depravity and ugliness in the world don’t exist, can beauty? Without the existence of The Holy Mandal Trinity to starkly contrast all that is lovely, what measure of beauty can we possibly have? So hats off, or shoes off I should say (tee hee!) to all you card-carrying members of The Holy Mandal Trinity, to be brave enough to walk this crazy mixed-up earth of ours ornamented in the various abominations that The Trinity has mercilessly thrust upon humankind. You Mandal wearers certainly are, like myself, a rare breed; just unfortunately, not rare enough.